Pioneers in the industry, we offer square bar holders and core holding devices from India. We are providing the superior quality Square Bar Holders to our clients as per their demand. We are providing the superior quality Square Bar Holders to our clients as per their demand. These products are available at affordable prices in the market as per the budget of our customers. The body of these products is made up of stainless steel which makes them hard and strong. These products have a good tendency to resist against corrosion. They are also known as triangular shaft end holders. 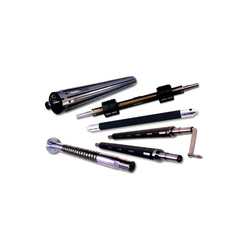 These products are used in both winding and unwinding positions. Anar Rub Tech manufacture, supplies and exporter a wide range of Core Holding Devices such as Air Shaft,Mechanical Shafts, Air Chuck, Safety Chuck, Industrial Quick Lock, Multi Tube Shaft, Air Shaft, Mechanical Shaft Bladder Less Shaft, Quick Lock Shaft, Differential Shaft (Clutch Shaft), Bottom Cutting Knife Holding Shaft, Air Expandable Shaft and Mechanical Expandable Shaft with best quality at very reasonable price .